Cookies & Cream rallied in the third and fourth innings, and Jordan’s solo homer in the bottom of the fourth proved to be the deciding hit as Questionable Outfit lost for the first time in 2017. Dinger started for Cookies & Cream, and he fell behind early as Questionable Outfit jumped out to an early lead. After Bob doubled to start the game, two batters later, Mike hit an RBI triple, making the score 1-0. Miller followed with a two-run blast, and Questionable Outfit led 3-0. Bob then doubled, but was caught trying to extend the hit into a triple, and the inning was over. Questionable Outfit sent their ace, Miller, to the mound, and he rolled through the bottom of the first, retiring Jordan and Joey in order. Dinger got into a groove starting in the top of the second, as he sent Tom and Mike down consecutively, and the score remained 3-0. Miller matched him in the bottom of the second, as Erich and Dinger were retired. Dinger retired two more Questionable hitters in the top of the third, and Cookies would cut into the Questionable lead in the bottom half of the inning. Jordan led off with a single, and moved to third when Joey followed with a double. Miller got Erich to ground out for the first out of the inning, but Jordan scored on the play, and Questionable led 3-1. Dinger followed with an RBI single, scoring Joey from third, and the lead had been cut to 3-2. Miller then retired Jordan to end the inning, and Questionable would get a run back in the top of the fourth. Tom led off the inning with a deep solo blast to left, making the score 4-2. Dinger then sent Mike and Miller down, and he had retired six of seven Questionable hitters. Cookies & Cream continued to fight back in the bottom of the fourth. Joey led off with a double, and Erich drove him in with a two-run shot, tying the game at 4-4. Miller retired Dinger for the first out of the inning, but Jordan followed with a solo homer, giving Cookies & Cream their first lead of the game. Miller then retired Joey to end the inning, and the score was 5-4. Bob started the top of the fifth with a single, putting the tying runner on first, but Dinger buckled down, retiring Tom and Mike to strand the runner, ending the inning. Miller rolled through the bottom of the fifth, retiring Erich and Dinger in order, and Questionable trailed by a run heading into their final at-bat. Miller helped his own cause to start the top of the sixth, hitting a single, and he was the tying runner. Dinger got Bob to ground out to right for the first out of the inning, but Miller advanced to second, putting the tying runner in scoring position. Mike came to the plate, but he was unable to capitalize, as Dinger got him to fly out to center, stranding the runner and ending the inning and the game. Cookies & Cream moved to 3-3 with the win, and Questionable Outfit dropped to 5-1. – Dinger pitched the complete game win for Cookies & Cream, giving up four runs on seven hits in six innings. – Miller took the loss for Questionable Outfit in the complete game effort, allowing five runs on six hits in five innings. – Jordan led Cookies & Cream on offense, going 2-for-4 with a single, the game-winning homer, two runs scored, and an RBI. – Joey also went 2-for-4 for Cookies with two doubles and two runs scored. 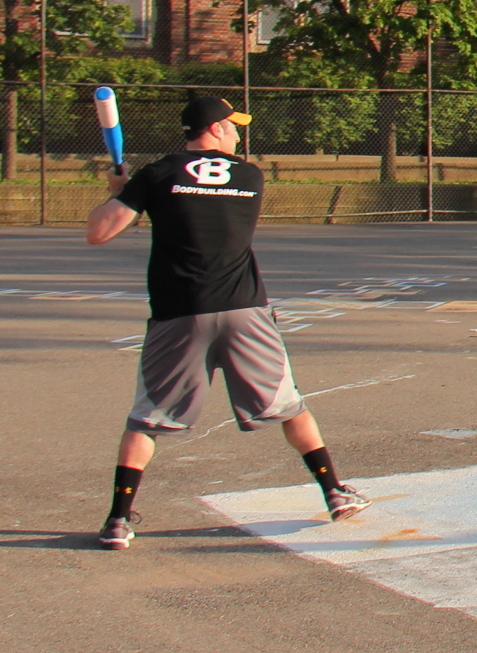 – Bob led Questionable Outfit at the plate, going 3-for-5 with a single, two doubles, and a run scored.